Where can I exchange foreign currency to yen? Paper bills, like US dollars and Euros, can be exchanged to yen at Gunma Bank (Kusatsu branch). The bank is open Monday through Friday, 9:00 - 3:00pm. A passport will be required for identification. You will also be asked for your contact information in Japan. Yucho Ginko (Kusatsu Post Office) – Monday through Friday, 8:45am - 6:00pm; Saturdays, 9:00am - 5:00pm; Sundays/Holidays, 9:00am - 2:00pm. Gunma Bank (Kusatsu branch) – Monday through Friday, 8:45am - 7:00pm; Saturdays/Sundays/Holidays, 9:00am - 5:00pm. A number of hotels and gift shops have FREESPOT Wi-Fi access points. If you visit these areas, you should be able to connect to the Internet. However, please check with each of the establishments for rules of use. Some FREESPOT Wi-Fi access points may require e-mail authentication. In many cases, check-in is from 3:00pm and check-out is by 10:00pm. However, times can vary so please be sure to check with your hotel/ryokan. 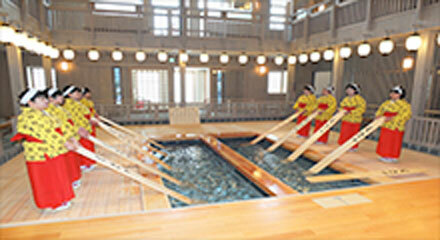 Is it possible to visit Jigokudani Hot Spring? Take the bus from Kusatsu Onsen to Shirane Kazan, transfer to the bus bound for Yudanaka Onsen and ride to Kanbayashi Onsen. Forty minute walk. Take the bus from Kusatsu Onsen to Karuizawa Station. Connect to the Shinkansen to Nagano Station. Transfer to the Nagano Dentetsu to Yudanaka Station. Take the bus from Yudanaka to Kanbayashi Onsen. Thirty minute walk. What is the weather like in Kusatsu Onsen? Kusatsu Onsen is located 1,200 meters above sea level. The average temperature is 7 degrees Celsius. Even during the hottest months in July and August, the average temperature is 17.5 degrees Celsius. The temperature rarely rises above 25 degrees Celsius. The summers are cool. The average wind speed is 1.5 to 3 meters and blows from the southeast in the spring and summer, and from the northwest in the fall and winter. In the winter, the northwest wind can bring a lot of snow to the ski slopes. One of the reasons why Kusatsu Onsen is the perfect destination at any time of year is because of its tableland climate. Some tourists like to leave tips, but this is not necessary. Kusatsu Onsen water is highly acidic. People with sensitive skin should be careful because the water may cause tingling, or skin irritation. The water is also known to corrode rings and necklaces. Kusatsu Onsen water is very hot. Here are some suggestions to help cope with the temperature. First try pouring some of the onsen water on your body. Take some water from the onsen using a bucket and pour the water on different parts of your body. It is best to start with areas that are furthest away from your heart. For example, begin with the ankles, then move up to your knees, back, wrists, arms, and shoulders. Your body should be adjusted after about ten buckets. This should prevent an increase in blood pressure after your bath. Note: please be aware of others around you when pouring water on your body. Allow your body to adjust to the onsen by submerging the lower half of your body first. Water pressure and temperature can place an unnecessary amount of strain on the body. Please be careful of spending too much time in the bath. It is best to get out when perspiration begins to develop on your forehead or on the top of the nose. Long baths can cause excessive perspiration and can place unnecessary strain on the body. For your safety, please limit yourself to about three bathing sessions a day. Kusatsu Onsen water is full of sulfur. Some people rinse themselves off after taking a bath, but that also washes away minerals that have health benefits. If you have sensitive skin, you may want to rinse yourself off because the sulfur may cause irritation. After taking a bath, please make sure you rehydrate yourself. Your body loses a lot of fluid through perspiration. It is recommended that you rehydrate by drinking water or a sports drink. Please rest after taking a bath. You may feel relaxed while taking a bath, but your body is actually getting a workout. It is important to rest for about thirty minutes because your body needs to adjust to the temperature changes. Are there any accommodation facilities that allow people with tattoos to use the large public bath? Almost all accommodation facilities do not allow people with tattoos to bathe in the large public baths. 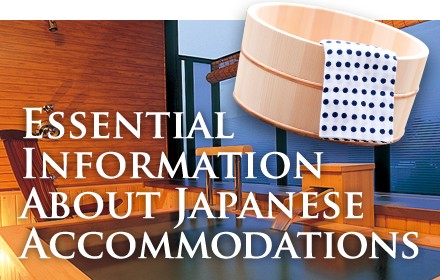 Please stay at accommodation with private baths to enjoy the hot springs.